While the world’s most popular energy sources – oil and gas – have seen prices sliding in 2014, another commodity – coffee – has leapt in price. Bad news for coffee fans and drinkers, but music to investors’ ears – droughts in “coffee” countries have sent the price of now precious beans soaring. The coffee price grew by 49 percent by October, when it reached $2.29 per pound, according to the data from the financial visualization service FinViz. The beloved morning drink is followed by Feeder Cattle which saw a 32 percent rise. ICE Coffee futures are now trading $1.65 per pound. Last year’s soaring prices for coffee have been blamed on record droughts in Brazil, the biggest coffee-growing country, in eight decades and harvest-hurting fungus in Central American states. These factors prompted such giants as J.M. Smucker Co’s Folgers and Starbucks Corp raise their coffee prices for drinkers as well. According to Ecom Agroindustrial Corp, in 2015 the coffee crop will be at least 25 percent larger than the July forecast from National Coffee Council’s which said that output would dip below 40 million bags. Ecom and Exportadora de Cafe Guaxupe Ltda says that May to October coffee harvest will reach at least 50 million bags. 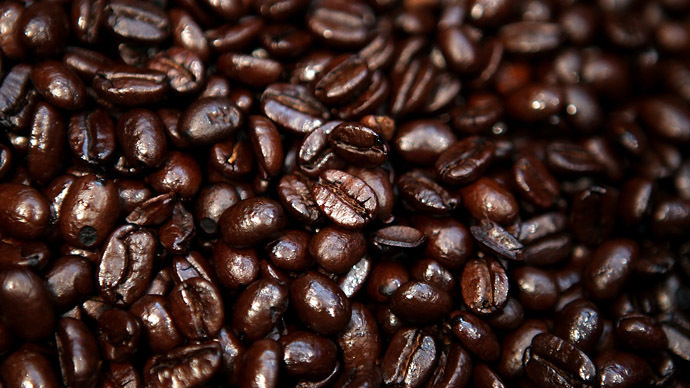 The global demand for coffee has never been higher, Bloomberg said. Throughout last year, sales expanded in US, Asia and Europe. According to the US Department of Agriculture, coffee consumption will reach 147.6 million bags in the marketing season, up 3.7 percent from the previous year. Compared to other commodities, coffee left behind precious metals, such as gold, silver and platinum which saw falls of 1.6 percent, 19 percent and 12 percent, respectively. Last year definitely wasn’t the best year for the world’s producers of the most popular energy sources – oil and gas – either. Their prices slipped, and they took the last places in the FinViz table. The performance of crude oil hit a record low: minus 45 percent.